When? Jun 27th, 6:30pm Where? Milan What? A special event focused to address the main legal and tax issues startups and founders face in the early stage of their business venture. 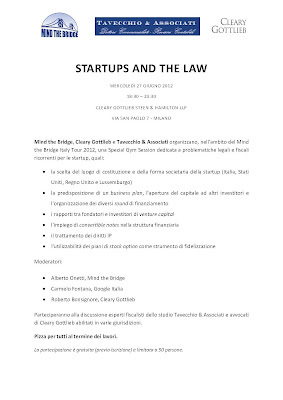 That's the goal of the event named "Startups and the Law" we organize in Milan in partnership with Cleary Gottlieb and Tavecchio & Associati. In this event, that is part of our Mind the Bridge Italy Tour 2012, we are going to have a sort of "Legal Gym", i.e. a Q&A session where startuppers and entrepreneurs can discuss with legal and tax experts about hot topics such as: - where to incorporate my startup(Italy vs US vs UK vs Luxembourg), pros and cons, - how to deal with investors, - how to manage my IP, - how to deal with convertible notes and stock option plans. The Q&A session will be moderated by Alberto Onetti (Mind the Bridge), Carmelo Fontana (Google Italia) and Roberto Bonsignore (Cleary Gottlieb). We provide high level information about the topics above and answer to some basic questions. Please anticpate on Facebook some topics/questions you would like to be addressed on Jun 27th or in one of the following Legal Gym sessions we plan to organize in the incoming months. The participation is free of charge (yep, free beer, since participants will get pizza&birra), but limited to 50 startups. Registration is mandatory, here is the link. First-come, first-served. 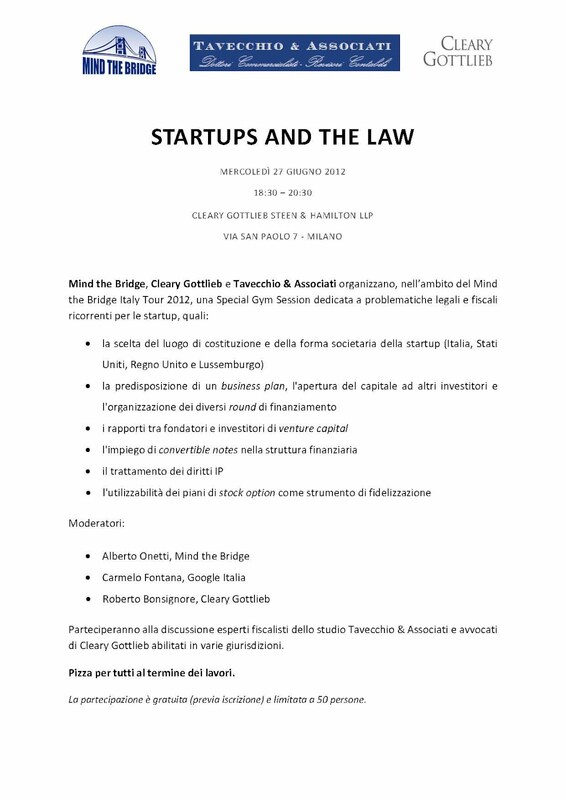 The event will be hosted by Cleary Gottlieb (Milan, via San Paolo 7), one of our long-term partners. See you there!